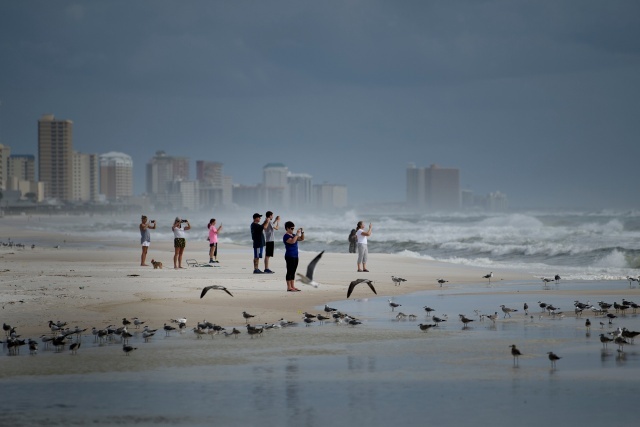 (AFP) - Hurricane Michael intensified Tuesday as it barreled toward the Florida coast, becoming a major Category 3 storm capable of "devastating damage" which the state's governor warned could be the worst in decades. Michael packed winds of 120 miles per hour (195 kilometers per hour) as it aimed for the Florida Panhandle, the finger-shaped strip of land on the Gulf of Mexico. The storm was expected to make landfall on Wednesday afternoon, bringing hurricane force winds, a "life-threatening storm surge" and heavy rainfall, the Miami-based National Hurricane Center (NHC) said. Rick Knabb, a former NHC head, urged locals in Michael's path to waste no time in evacuating. "#Michael could be one of the worst hurricanes to ever strike the Florida Big Bend/Florida Panhandle region," he warned. "We only have today and Tuesday to complete lifesaving preparations at the coast and inland. Evacuate as instructed from storm surge and shelter smart from wind!" Governor Rick Scott, who has activated 2,500 members of the National Guard in response, echoed Knabb's assessment saying that: "Hurricane Michael poses a deadly threat (as the) most destructive storm to hit the Florida Panhandle in decades." Panama City Beach fire department chief Larry Couch urged residents to evacuate. "If they decide to stay, there will be a point where we can't get to them," Couch said. "We will shut down operations at a certain point and when we do that, they're on their own. "Be safe and leave," he said. President Donald Trump issued an emergency declaration for the state, freeing up federal funds for relief operations and providing the assistance of the Federal Emergency Management Agency (FEMA). "It is imperative that you heed the directions of your State and Local Officials. Please be prepared, be careful and be SAFE!" Trump tweeted. As of 8:00 pm Eastern time (0000 GMT), Michael was about 255 miles (410 kilometers) south of Panama City and moving north at 12 miles per hour (19 kph). The NHC said some areas of the Florida coast could expect storm surges of nine to 13 feet (2.7-four meters), and as much as a foot of rain. The storm is a Category 3 out of five on the Saffir-Simpson hurricane wind scale. Drivers waited in long lines at gas stations and residents hurried to fill sandbags, while tolls were suspended on some roads to aid movement ahead of the storm's landfall. "Since 6:00 am it's been backed up. We're just now running out of regular (gasoline)," Danny Hess, an employee at a gas station in Panama City, told local WJHG television. Last year saw a string of catastrophic storms batter the western Atlantic -- including Irma, Maria and Harvey, which caused a record-equaling $125 billion in damage when it flooded the Houston metropolitan area.